“The number one objective for a newspaper is to be talked about,” said Matt Kelly, editor of The New European, speaking at the Digital Media Strategies conference today (22 February). 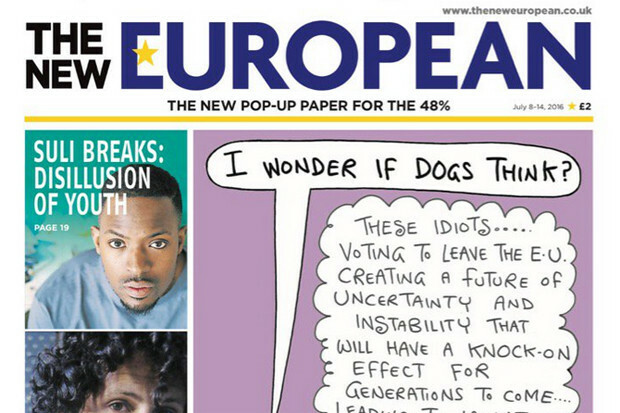 He explained that the ‘pop-up’ national paper, which went from concept to publication in nine days, owes its success to the strength of the community which it serves – the 48 per cent (16 million) of Britons who voted to remain in the European Union. “On the day of the result, there was a sense of bereavement, that something awful had just happened – a collective sense of gloom,” he said. The idea that print could be a form of visible anger and sense of community led regional publisher Archant to boldly launch a weekly newspaper on 8 July 2016. “The idea is that it costs £2 to join a community and you get a free newspaper every week, and that’s very much the sense we’ve got from our audience,” he said. It’s the defined audience that has prevented it from slipping by the wayside like other new publications such as The New Day, which closed just nine weeks after it launched, he added. And, as Kelly explained, the production team are there for the passion of the cause, with writers seeing it as a good element in a “diminished moment of media plurality”, with many of them contributing for free, writing features as long as 3,000 words. “Longform journalism is our preferred length, because as we are moving into a society that is so reductive, where word counts are collapsing everywhere, and sophisticated thought is contracted as well. The first edition sold over 40,000 copies, double of what the team at Archant were expecting, and is now selling an average of 25,000 copies a week. “We still think it is a short-lived product, but the paper keeps growing and changing. We were only supposed to run for four issues,” said Kelly. “It makes you less scared about the potential of failure – we set out saying if it doesn’t work we’d kill it after a few weeks.